A few months ago I was at my friend Erica's house and fell in love with a delicious little snack she made. It was a scrumptious little baked doughnut. 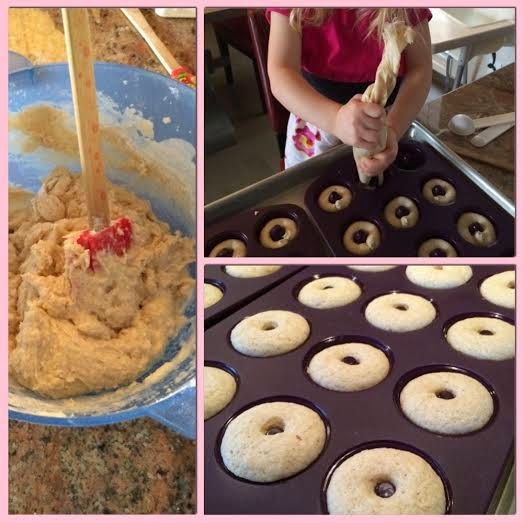 When she told me they were super simple to make, I promptly called my sister and asked that she please please please buy me the Epicure mini doughnut molds for Christmas. She sells Epicure products, and I knew she would pull through for me. Erica said that the recipe that comes with the doughnut pans was super simple and quick, and she was definitely right. I couldn't seem to find the doughnut molds on the Epicure website , so I'm wondering if they discontinued them. Regardless, go out and buy another brand of silicone mini doughnut pan, because it will be well worth it. I finally got around to trying them yesterday afternoon with my daughter. Our family was invited somewhere for a post-holiday drink and thought I should bring a treat with us. I like to bring baked goods to other people because it means I get to enjoy the fun of making them, without having too much temptation to eat all 24 minute doughnuts in one sitting. In a small bowl, mix the flour, baking powder, salt, and cinnamon. In a separate bowl, cream together the butter and sugar until light and fluffy. Beat in the egg and vanilla. Stir in the dry ingredients alternately with the 1/3 cup milk. (I used about 3 additions of each). Do not over mix. After lightly brushing the doughnut pans with oil, I put the batter into a disposable pastry bag to fill the doughnut molds 2/3 full. Bake in a preheated 400 degree F oven for about 12 minutes (or until a toothpick inserted in them comes out clean). Let the silicone pans become cool to the touch before twisting the doughnuts out. 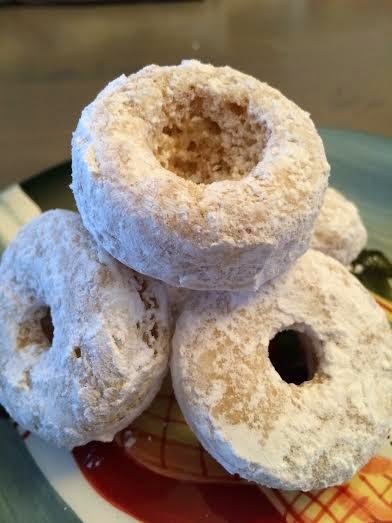 I chose to toss my doughnuts in icing sugar (I used 1/2 a cup in a Ziploc bag). Toss them when completely cool if using icing sugar. This is a great recipe to make with kids because the stirring and measuring is simple for them. At the end my daughter played with the little bit of leftover batter in the pastry bag, and even helped fill a few of the molds. She's becoming quite the little baker at almost three!